It has been a year since I came back to Bogotá after two years living in Egypt, where I got to know some of the young people leading nonviolent protests and cultural activities. If I had been part of the Mubarak government, I couldn’t have planned it better; I left Cairo just five months before the revolution began. As I followed the news of what was happening there in February and March, I was here in Colombia, but a part of me was over there, hoping to see change, waiting to be part of it. Cairo was a tough place to be—so hot, so brown, and hard for a woman, especially a woman who comes from green mountains, from a country with uncountable rivers, lagoons, and lakes. But what I missed the most while living there was my bike. I never saw a woman cycling, nor a businessman. Bread deliverers were on bikes, along with the very badly-paid workers risking their lives on a daily basis by crossing the 23-kilometer-long bridges that go through Giza and Zamalek to Heliopolis. Besides them, it was just a few foreigners living in wealthy neighborhoods dared to use a “steel horse” to go around on weekends. I hope that’s changing. Still glued to the news from Egypt, I recently saw a picture of veiled women cycling there and thought proudly about one of the main goals of the recent struggle: elevating the position of women in public sphere, increasing their mobility, and challenging assumptions about women’s roles and limitations. In Cairo I missed the feeling of freedom that bicycling gives, and the free circulation of body and mind between the traffic jams and hurried pedestrians. The first thing I did when I came back was repair my bike, which had been damaged by misuse, and ride around on it, rediscovering my city and exploring what had changed while I was gone. Bogotá is now a very chaotic place, with traffic jams everywhere, all the time. Its public transportation system is degrading, and there is still no subway, even though there are now nine million of us. All that people seem to want here is a house and a car, repeating the consumerist mantras of consumption, well-being, and self-satisfaction. But there’s good news, too. As transportation in the city becomes ever more scandalous, a lot of collective initiatives are arrising to change people’s mentality towards mobility and public space. During the last six months, I have been following the the groups that advocate for the use of bicycles instead of cars: Ciclopaseos de los Miércoles (Wednesday Rides), Mejor en Bici (Better by Bike), and La Redada (The Raid). What I found especially interesting is how—without always knowing the full political implications—their advocacy is inviting people to create nonviolent responses to the endemic violence of the city. Some of these initiatives emerged out of Critical Mass, the direct action movement founded in 1992 in San Francisco. The concept was appropriated by a group of artists, joined by their friends, and then by friends of friends. The biggest Critical Mass so far has been the alternative parade on Colombian Independence Day on July 20th, when around 120 people gathered to go biking alongside the traditional military parade. 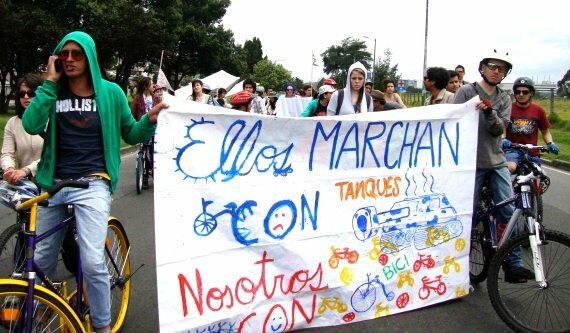 The slogan of the mobilization was “Ellos marchan con tanques, nosotros marchamos con bici” (“They march with tanks, we march with bikes”). All at once, they declared independence from the use of cars, the parade’s monopolization of street use, and the historical legitimization of military violence. The use of bikes brings equality. Traditionally in Bogotá, only the working class rode bicycles. Many have to ride long distances from south to north, with no bike paths or other protection, because they can’t afford transportation expenses. Since 1997, however, construction began on a 340-kilometer CicloRuta (BikeWay) all over the city. The CicloRuta connects with parks and avenues, and it goes from poor neighborhoods to affluent boulevards. Whenever one of the three groups I’ve followed calls for a massive ride, they try to gather participants who are diverse in age and socioeconomic class. The use of bikes instead of public transportation and cars is also becoming a way of changing how the city’s reality is perceived, transgressing the invisible barriers built across public space. Every Wednesday, the Ciclopaseos de los Miércoles gather around 150 people to ride through some of the city’s most dangerous neighborhoods. (Last July 27th, they reached the astonishing number of 370 people for their fifth anniversary.) Bogotá can be a violent city, with widespread criminality, gangs (from petty to paramilitary), and robbery. Some neighborhoods in the south are historically stigmatized by the presence of forcibly-displaced people from the countryside, who live among homeless people in the streets and red-light districts. These rides often visit such neighborhoods—at night, no less—repudiating the fear and re-appropriating areas of the city usually thought to be dangerous and even inaccessible. One of the activists talks about these rides as moving heterotopias, in the terms of French social theorist Michel Foucault: a mobile, non-hegemonic space. For cyclists in Bogotá today, a mode of transportation has become a way to resist and to raise awareness about the need for inclusion and social transformation.